I, as I imagine you are too, am knee-deep getting ready for the holidays. Baking, shopping, wrapping and decorating – it’s all happening at once, just like always. In between this craziness though, my sweet tooth never wanes, and I’m always on the hunt for new desserts that satisfy that and don’t expand my waistline. 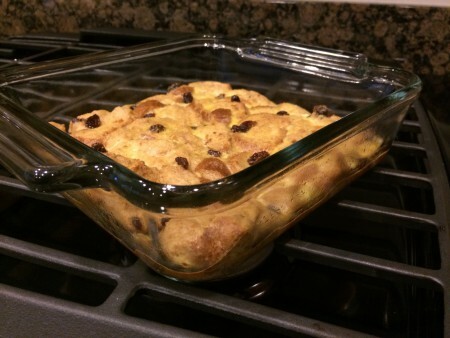 If you’re anything like me, and you like the ooey, gooey, goodness of bread pudding, you’ll love this lightened up version of bread pudding I whipped up recently. Like I said, the holiday craziness is upon us: parties, presents and the ever-dreaded fruitcake – it’s all there. But just because there are calories galore at every turn (believe me, at my office, it’s an off day if there’s not at least one tray of leftover sandwiches and cookies from somebody or other), that’s no reason to blow your diet completely. When do you want to look better than ever, than the holidays? I know I certainly do. And even though I want to look good, I still want to indulge my sweet tooth like a normal person, which requires a little creativity in the kitchen, and pays off big in the outcome. What I’m getting at is that with a few tweaks, your favorite holiday recipes can be lightened up so you have no guilt indulging: like my lightened up bread pudding. I hope you like the great, warm taste as much as I do – no guilt required and no one will know the difference! Preheat oven to 325 degrees Fahrenheit. Spray an 8×8 inch (or smaller) baking dish with non stick spray and set aside. Cut up bread into squares and place in a medium-sized bowl. Heat the skim milk in a small sauce pan over low-medium heat, until small bubbles start to form on the edges. At this point, turn off the heat and remove the sauce pan from the stove. Don’t let the milk actually boil. Add the hot milk to the bread cubes and let them stand together for 4 – 5 minutes, allowing the bread to soak in the milk. Add the Stevia, cinnamon and raisins to the bread and milk and gently mix all together. Beat the eggs in a separate bowl, then add them and the vanilla extract to the bread and milk mixture, stirring gently to combine. Pour the mixture into the sprayed baking dish and place in the oven for 45 – 50 minutes, until the bread pudding is firm. Once the dish is removed from the oven, allow it to cool for 20 minutes before sprinkling powdered sugar over the top and serving. The bread pudding fresh out of the oven. Isn’t that good looking? 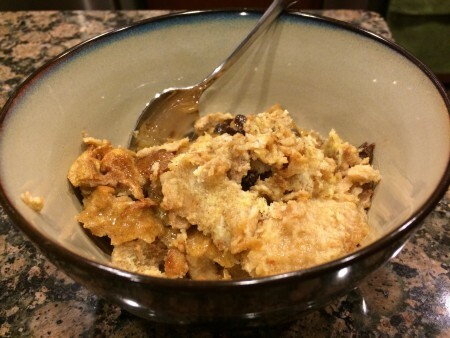 The finished product: bread pudding in bowl. This is so good with just a little bit of powdered sugar and warmed up. 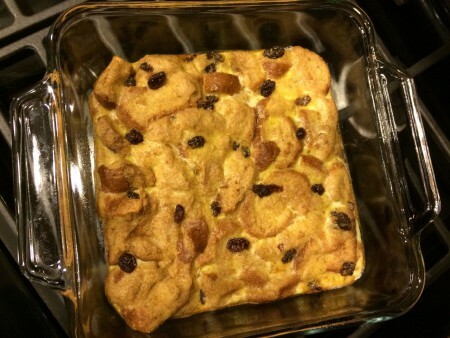 This entry was posted in Desserts, Recipes and tagged Bread, Bread Pudding, Desserts, Easy, Holidays, LIght, Light Bread Pudding, Low Cal Bread Pudding, Low Calorie, Low-fat, Pudding, Raisin Bread Pudding, Raisins, Recipes on December 7, 2014 by Paige N..
Can I use coconut sugar instead of this sugar? Sure thing. Sugar, coconut or palm sugar, stevia sugar baking mix – they should all give the same result.